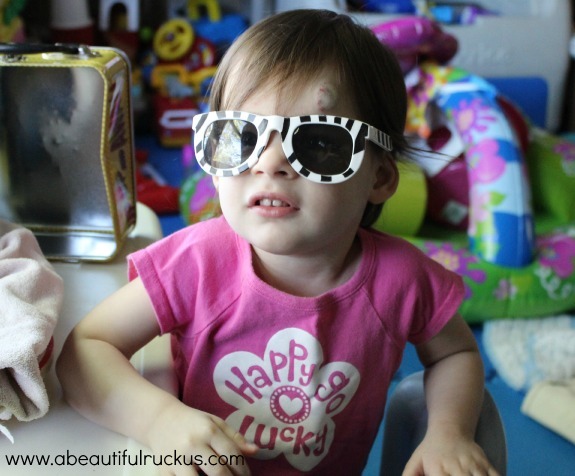 A Beautiful Ruckus: What's Wrong With My Head, Daddy? What's Wrong With My Head, Daddy? All squeaky clean, I passed Ellie off to her Daddy. As we've always done, he took her over to the mirror so that she could see how clean and cute she was in her pajamas, with her hair freshly washed and dried. We've done that since the beginning. We let the kids look in the mirror and talk about who they see looking back. They love grinning at themselves, and we always like to hold our baby-fresh toddlers before the next poop comes along. Instead of the giggles and kisses that we've come to expect from Ellie when she looks in the mirror, her face suddenly creased with worry. She slowly lifted her hand up to her face and carefully touch the large red bump protruding from her forehead. From where I was sitting on the bed, I saw the expression on her face and realized that she was trying not to cry. "Sean?" I asked. "What's wrong with, Ellie? Why is she sad?" I already knew the answer, but I was hoping he would say that there was a different cause. He looked over at me and quietly said, "She just found her hemangioma." My heart sank. I thought we would have more time before she realized that she looks different from her siblings. Sean tried to comfort her as it became apparent that she was very distressed about the way she looks. She repeatedly touched her head, trying to figure out what was wrong, "Oh Ellie, you're okay. You look beautiful. Don't worry about your head. You are beautiful to me, and I love you so much." Granted, my emotions have been on high alert this week, but I fought back tears as I realized that her self-image was now suffering. You are only two-years-old, baby girl. I'm not ready for this next stage of parenting. Sean took Ellie downstairs to play with her brothers and sister as I picked up our bath items. Sean came back upstairs and simply said, "My heart hurts." As soon as I finished up, I went downstairs and picked Ellie up off of the couch so that she could snuggle into my arms. I didn't reference her hemangioma again, but I whispered in her ear, "Jesus thinks you are beautiful and special just the way He made you. And I do too, Ellie. I love you." The dermatologist said that her hemangioma should fade by kindergarten, but I can't take her out of the house without someone (or several someones) offering me ice for her head or asking if she fell and hurt herself. I try to brush off the comments, but I worry that her self-consciousness will grow as she is now very aware that she has something on her face. I talked to a nurse friend, and it sounds like it's time to request insist on intervention. Parenting just got a little more difficult. Sweet girl! I hate how our outside appearances become so apparent at such a young age... sounds like you handled it beautifully! I'm tearing up, too. 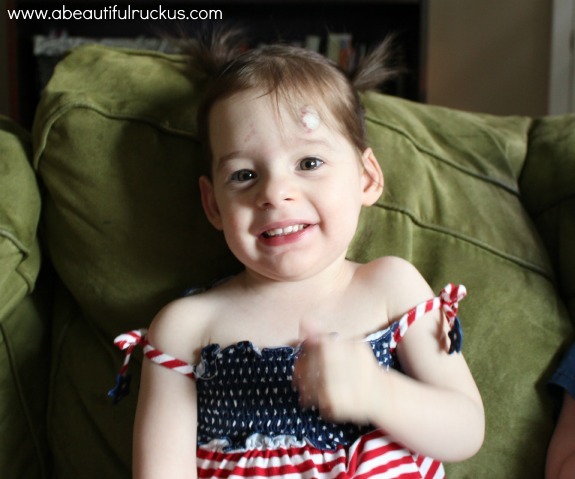 She's gorgeous and I hate that her little two-year old self has noticed and is concerned with her hemangioma. If only we could protect our children from themselves. =) You handled it so well and so lovingly. Poor baby girl. Thanks :) And we definitely all have things that make us different. Some are just a little more visible than others. Ugh, then you understand exactly what it's like when I go out with my Ellie. I want to protect her so much! But yes, I'm sure God has a reason for why He chose to give our kids visible differences. Who knows? It's exciting to think that our kids may one day help other kids who look a little different. Aw, what a sweetie. It's hard to be different, even in a small way. But you guys are handling it SO well. Aw! Poor girl! She's beautiful just the way she is! My little brother had one on his stomach. It took a few years, but it faded. 20 years later, all that remains of his is a little raised patch and to see it you have to know what to look for. I have heard that they fade, and hope that this one does soon! Just for Ellie's sake. Thanks, Melly! It sounds like we have similar issues. Blessings to you as you parent your son! *hug* I feel your mama heart. I can't relate exactly, of course, but I had a similar moment recently when Cora noticed that she's missing more teeth than her peers. I knew the day would come, but it still snuck up on me a bit. :( Since she's three, I answered her pretty matter of factly (the doctors had to take two out because they had ouchies, and the other two still have ouchies, but they are getting better) and waited to see if she needed more comfort that that. She didn't seem to, thankfully. My plan of action is to find a balance between sympathy and encouragement. I think it's ok if they know it't not "normal." I think they will see through any attempt to try and convince them that their particular differences are beautiful in and of themselves (because of course that is true - that we and God find them beautiful inside and out, WITH their differences, but it still remains that most of the world wouldn't classify their differences as beautiful, They would say they are beautiful in spite of their differences). I *think* at this point the healthier attitude is that yes, our bodies are all fallen and broken in different ways - some more noticeable than others - and it's ok not to like that part of yourself very much. Ok to grieve, you know? But one day, in perfection, God will make real beauty from those ashes. And we WILL have perfect bodies. Thank you for your thoughts, Anjanette. I can understand your point of view, but I think my two-year-old might be a little young to understand an explanation quite that detailed. We might stick with our answer until she gets a little older and asks more questions about it. That made me tear up a little bit. She is such a beautiful little girl! You guys are awesome for the positive remarks you give her. she is lucky to have you as parents! You did a great job of handling the situation. She's going to need some extra hugs and kisses and reassurance that everything is ok but I'm sure you've got that covered. She's beautiful no matter what and you've just got to make her believe it. She's 2 and they tend to accept things a lot easier than grown ups. Sending hugs your way from Madison & I.
Aw, thanks! She is beautiful and precious, and we will keep telling her that! Ugh...I would not have expected a two year old to worry about this either. Sydney has three hemangiomas. One on her forehead, one on her shoulder blade, and another on her right knee. The one on her head is partially covered by bangs, but she may too notice and be bothered by it in the future. It looks like Ellie's is getting lighter so I hope it does vanish soon. In the meantime, sounds like you are handling it well. Thanks, Amber. We are hoping it fades as well. The doctors told us by kindergarten, but a lot of literature says by age 9. That seems like a really long time away. Oh no! I'm sorry to hear that; it sounds painful! I hope he is doing better now! I looked at your post, and you have a beautiful daughter as well! I think you made the right choice to let her wear summer clothes. Someone suggested that we put a hat on Ellie every time we go out, but I don't want her to think we are ashamed of it either. It sounds like we are both doing the best we can for our little girls.